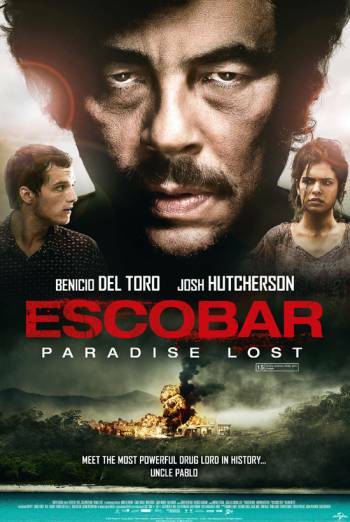 Summary ESCOBAR: PARADISE LOST is a drama about a young Canadian who becomes involved with the family of the Colombian drug baron, Pablo Escobar. ESCOBAR: PARADISE LOST is a drama about a young Canadian who becomes involved with the family of the Colombian drug baron, Pablo Escobar. There is a scene of strong violence in which men are shot with sight of blood spurts. There are also scenes where violence is implied but not shown, such as when a character is listening on a phone to the sound of gunshots and the cries of a mother as she and her young son are executed. There is strong threat, including a scene in which a man is attacked by a fierce dog. There are scenes set in the aftermath of violence that show bodies with bloody injuries, and an image of two charred corpses strung upside down from a tree. There are also references to illegal drugs and the drug trade.